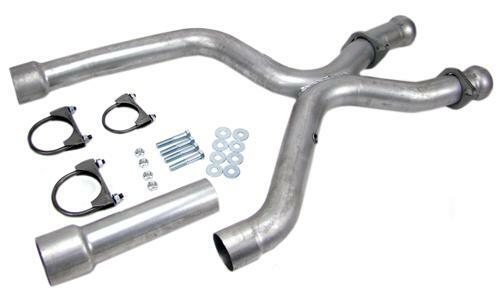 Increase the power and performance of your 1996-2004 Mustang GT with this Pacesetter off road x-pipe from Late Model Restoration! PaceSetter X pipes have been shown to deliver more power and a more powerful sound from your 1996-2004 Mustang GT. The X-pipe design helps exhaust pulses scavenge each cylinder for a much better flow. PaceSetter Off-Road X-pipes are mandrel-bent from 2-1/2" diameter, 16-gauge aluminized tubing. Each X-pipe fits 5-speed and automatic transmission applications. For use with PAC-703230,PAC-72C3230, PAC-703229 & PAC-72C3229 Long tube headers.